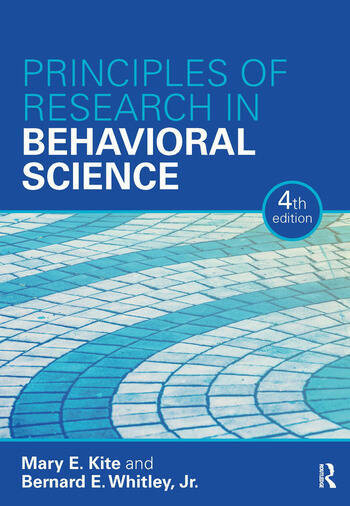 This book provides a comprehensive overview of research methods in the behavioral sciences, focusing primarily on the conceptual issues inherent in conducting research. It covers topics that are often omitted from other texts, including measurement issues, correlational research, qualitative research, and integrative literature reviews. The book also includes discussions of diversity issues as they related to behavioral science research. New to this edition are chapter boxes that focus on applied issues related to each chapter topic. Throughout the book, readable examples and informative tables and figures are provided. The authors also take a contemporary approach to topics such as research ethics, replication research, and data collection (including internet research). Is Applied Research More Ethical Than Basic Research? Should Research on Some Topics Be Banned or Restricted? Is There an Ethical Obligation to Conduct Research? How is Qualitative Research Evaluated? Mary E. Kite is Professor of Social Psychology at Ball State University, USA. She received her Ph.D. from Purdue University. Her research focuses on stereotyping and prejudice toward women, gays and lesbians, and older adults. She has served as President of The Society for the Teaching of Psychology (STP, APA Division 2) and Secretary-Treasurer and President of the Midwestern Psychological Association (MPA). She is a Fellow of APA Divisions 2, 8, 9, 35, and 44 and of the Association for Psychological Science and MPA. In 2014, she received the Charles L. Brewer Distinguished Teaching Award from the American Psychological Foundation. She co-authored the third edition of The Psychology of Prejudice and Discrimination with Bernard E. Whitley, Jr.
Bernard E. Whitley, Jr. is Professor Emeritus of Psychological Science at Ball State University, USA. He received his Ph.D. in Social Psychology from the University of Pittsburgh. He is a Fellow of the American Psychological Association and charter member and Fellow of the Association for Psychological Science. His research interests focus on the roles of ideological variables in prejudice, and he has published in many journals including Psychological Bulletin, Journal of Personality and Social Psychology, and Personality and Social Psychology Bulletin. His other books include The Psychology of Prejudice and Discrimination with Mary E. Kite and Academic Dishonesty: An Educator’s Guide (2002) with Patricia Keith-Spiegel.